Contemporary images of Caterham show that it did indeed have many of the characteristic features of a large nineteenth-century asylum, namely the looming water tower, the imposing façade, and the daunting administrative block. However, such interpretations and geographical readings tell only one part of the story. As someone who is interested in the lived experience of idiocy, imbecility and feeblemindedness in the long nineteenth century, I am curious about the reception, perception and organization of the imbecile asylum. Caterham offers a number of alternative spatial, organizational and geographical counterpoints to the historical cliché of the imposing and socially isolating asylum. By paying attention to spatial aspects – the building of Caterham, its location, its engagement with its immediate environment – a multifaceted picture of the asylum emerges, one that is not easily explained by notions of stigma, isolation and segregation, as posited by Scull and Goffman. The spatial lens also allows for a more nuanced image of contemporary attitudes to the asylum and to idiocy. When it opened in September 1870, Caterham was both a typical and a unique institution. Typical in that with its 1,500 beds it was a large ‘barrack’ style asylum, reminiscent of other large county and borough lunatic asylums, institutions which had become, by the latter part of the nineteenth century, an accepted spatial solution to the social burden of the mentally ill. However, it was unique in that it was an asylum built for the chronically insane adult population, more commonly referred to at that time as idiots, imbeciles and the feebleminded. Another point of uniqueness that distinguishes Caterham from the more familiar lunatic asylums was that it was born, not of the lunacy reforms of the 1840s, which led to the building of the more familiar county and borough lunatic asylums, but rather of the workhouse and public health reforms of the 1860s. These reforms called for the complete reorganization of the poor law system, and for separate accommodation to be provided for the sick, infirm, and insane, which by the mid-nineteenth century were dominant figures in the workhouse population. Following a number of exposes published across the popular and medical press, including the infamous Lancet Sanitary Commission for Investigating the State of the Infirmaries of Workhouses (1866), Parliament passed the Metropolitan Poor Act in 1867, ‘for the establishment in the Metropolis of Asylums for the Sick, Insane, and other Classes of the Poor’. This act also led to the founding of the Metropolitan Asylum Board (hereafter referred to as MAB), an offshoot of the Poor Law Board, whose responsibility was the building and management of these new asylums. The founding, character and remit of the MAB, as a health and welfare organisation, had important implications for the geography, design, and location of Caterham. 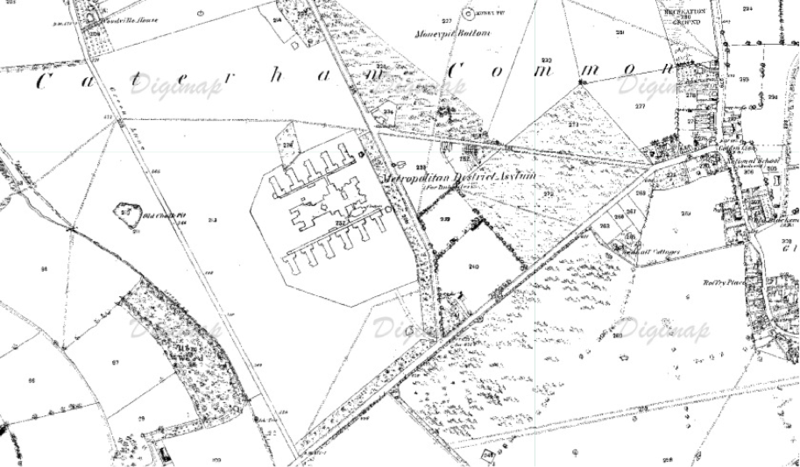 An 1870 Ordnance Survey map shows Caterham, set in rolling countryside surrounded by fields with a few houses and farms dotted nearby. 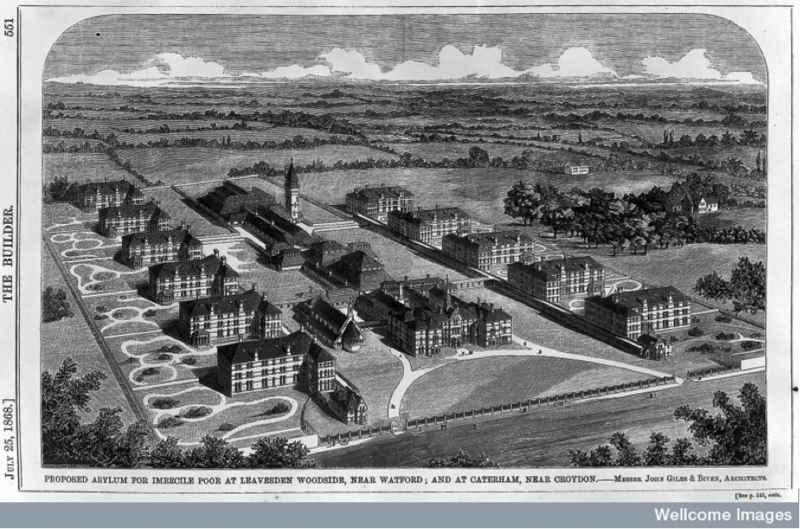 At first glance, it seems as though the location of the asylum was chosen primarily to place it away from society. However, a closer reading of the map, one informed by committee minutes and annual reports, and the nature of the MAB, challenges this interpretation. It suggests that the asylum’s location, design, and built environment was in fact dictated by matters related to health, sanitation, and respite, rather than matters of social segregation and isolation from the community. One of the first questions addressed by the committee charged with the building and management of the two MAB imbecile asylums was how they ought to be designed, and where they ought to be sited. 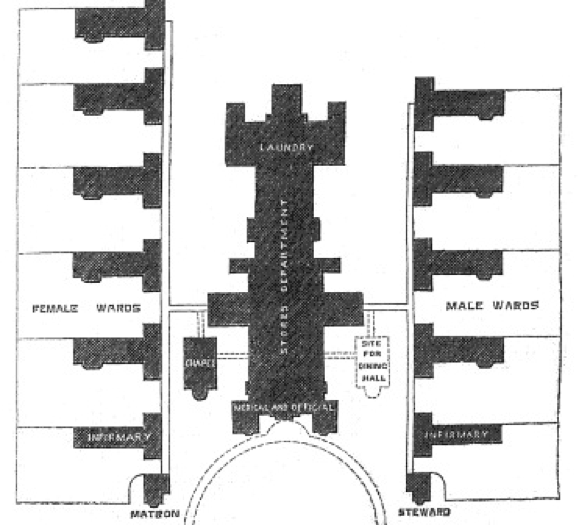 Caterham’s eventual design was not that of a typical asylum, many of which were built on the ‘linear plan’, such as that used at the Middlesex County Lunatic Asylum (otherwise known as Colney Hatch Asylum), which saw patient accommodation running off a main central corridor. When the Middlesex asylum opened in 1851, it was the largest lunatic asylum in Europe, and is reputed to have had the longest corridor in Britain, taking 2 hours to walk from end to end. Instead, Caterham was built on the ‘pavilion plan’, a layout typically used in the emerging modern hospitals and infirmaries, championed by Florence Nightingale, George Goodwin, (an influential nineteenth century architectural writer), and Isambard Kingdom Brunel. It was a design that was celebrated for its sanitary efficiency, assisted by the arrangement of patient accommodation over three floored blocks, and the numerous windows positioned in such as manner as to ensure near-constant ventilation. These winds, as well as the high elevation, good soil, and excellent drainage had led the committee to select the 72 acre site, which sat above the Caterham Valley, with convenient existing transport links to London. The healthful and sanitary features given as the primary qualities of the location hint at the motivations of the management committee in their selection of the site, which suggests that sanitation rather than isolation was a deciding factor. Caterham Asylum (Ordnance Survey Map, 1910). Returning to Goffman’s assertion that asylums were stigmatized and segregated sites on the periphery of society, contemporary maps suggest a different social response to the asylum. The relatively dense concentration of houses surrounding Caterham suggests that the asylum may not have been particularly off-putting to the local community. 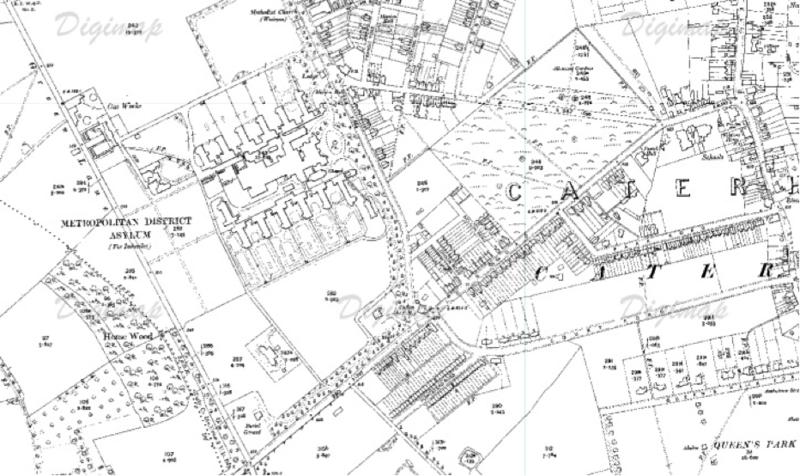 In fact, maps show that the village of Caterham effectively migrated up the hill, towards the asylum, and not away from it. Later maps show that the area surrounding the asylum was by then heavily developed, and by the end of the nineteenth century a significant number of houses had been built within close proximity. Some of these new buildings were terraced homes, built to accommodate the growing numbers of families and workers who populated the village of Caterham, and in some cases worked within the asylum. The unproblematic omnipresence of the asylum is also reflected in a number of local names. The main road running through the ever-growing village was named Asylum Road, for instance (it remained so-called until the 1930s, when it was eventually changed to The Westway). The presence of respectable lower-middle and middle class occupations on this road suggests that the name was not applied derogatorily to a dubitable part of town. Occupants of the houses neighboring the asylum included plumbers, bricklayers, dressmakers and cooks, with some also engaged in semi-professional occupations, such as clerks, postmen and shopkeepers. A significant number were small-scale employers, who boasted a certain level of economic ability and status. The pub just opposite the gates of Caterham was called ‘The Asylum Tavern’. It was used by a variety of locals and visitors to the town and the Asylum, and a number of patients would regularly climb over the walls of the asylum to frequent the pub, returning to their wards slightly the worse for wear, and receiving a ticking off from the Medical Superintendent. Asylum Road, Caterham (Ordnance Survey Map, 1910). It is not just in the historical archive that we can find positive responses to the asylum, an institution that was a key constituent of the village’s landscape, as well as a dominant feature of both the areas skyline and local memory. In the spring of 2013, Tandridge District Council, where Caterham was located, proposed that a number of roads in the housing development on the site of the asylum be named after key figures from the asylum. The council stated that they wanted to maintain ‘a connection with the history of the site’ and Councillor Martin Fisher claimed that it would keep ‘part of the history of the hospital, which was a fixture of Caterham for 124 years.’ Suggested individuals included Emma Mosely, Caterham’s first Matron who lived and worked at the asylum for 24 years, as well as Dr James Adams, the asylum’s first Medical Superintendent. Another notable suggestion was Samuel Gibson, a patient at Caterham who was one of the last survivors of the Battle of Waterloo, and upon his death in 1891 was given full military honors with nearly 600 men from the neighboring army barracks attending the funeral. These biographical snippets and their mapping onto the geographical landscape illustrate a response to Caterham that challenges an idea of asylums as warehouses for society’s residuum. They instead suggest interaction, engagement and a porosity of the asylum walls which is not always captured in more traditional sources used by medical and social historians when researching institutions. We can see from the geography of Caterham that the history and the memory of medical asylum sites should not be simply explained away by notions of stigma and social outcasting. Segregation and isolation are perhaps in the eye of the academic beholder, and by paying attention to debates concerning the design, and location of such institutions, it is possible to see a different motivation, a different arrangement, a different experience, and a different lived reality of these sites and of the patient’s who resided there. The academic endeavor to question and uncover more of these institutions can help us develop greater sensitivity to the lives of those who worked and were treated there, too often overlooked by history yet still remembered by their communities. Stef Eastoe is a PhD student in the department of History, Classics and Archaeology at Birkbeck College, University of London. Her thesis explores the social history of idiocy in the long nineteenth century, focusing on Caterham Imbecile Asylum. Her twitter handle is @stefeastoe. William Gilbert ‘The Idiot Colony at Caterham’ Good Words Magazine, 1872, pp.271-277. Leonard Smith notes the symbolic nature of the asylum building, with many designs ‘reflecting the twin standards of custody and cure, combining elements of both the penitentiary and the infirmary’ (p.32). Similarly Anne Digby has remarked on the ‘imposing’ façade of early county asylums, and Ian Sinclair, a journalist and writer, highlights the ‘baleful presence of the water-tower’ of now closed asylums on the London skyline, hinting both at the uncomfortable history that they represent to many, and how they are received and interpreted by the wider public. Caterham’s sister institution, Leavesden, opened at the same time as Caterham. Situated in Hertfordshire, it dealt with patients drawn from poor law unions in North London, with Caterham catering to those from unions in the south. The Builder July 25th, 1868 p.549. Metropolitan Asylum Board Committee Minutes, London Metropolitan Archives MAB 247/248, 11th September 1874 p.112. Minor point — Colney Hatch was the 2nd Middx County Asylum, the 1st being Hanwell (1831). It was indeed, thanks for pointing that out. With idiot and imbecile asylums being built in a different institutional network, there is little reference to such sequential matters.